Persecuted for years as a robber of game, as attitudes have slowly changed and over the past 50 years, Northern Goshawks have expanded their breeding range and increased their population size in the Northeastern U. S., including the Central Appalachians. 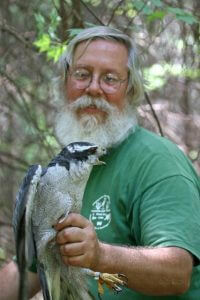 Since 1977 Dave Brinker has studied goshawks in both Northeastern Wisconsin and the Central Appalachian Mountains. Initiated in 1994, the Central Appalachian Goshawk Project has monitored over 100 goshawk nesting attempts, banded 63 nesting adults, and investigated winter movements of breeding adults from NW Pennsylvania down the Appalachian Mountains through the high country of West Virginia. Dave Brinker has worked for the Maryland Department of Natural Resources since 1990 where he is currently a Regional Ecologist with the Natural Heritage Program working on biodiversity conservation. Professionally he works on colonial nesting waterbirds, obligate marsh nesting birds, freshwater mussels and odonates. Dave’s fascination with Northern Goshawks and wildlife cycles began in Wisconsin shortly after obtaining his B.S. from the University of Wisconsin-Green Bay in 1977. After moving east, he continued working on goshawks nesting in the Monongahela National Forest in West Virginia. This passion grew into the Central Appalachian Goshawk Project that now monitors goshawk territory tenacity, survival, and reproductive success, at nest sites in West Virginia, Maryland and the Alleghany National Forest in northwest Pennsylvania. Dave is also a founding co-director of Project Snowstorm, a collaborative effort to better understand the wintering ecology of Snowy Owls.